I will be completely honest--I have been suffering the winter blues. Living in the country during the winter months can be isolating, not to mention the sunshine deprivation. It is as clear as a day in spring that I need to start to take some self-care action. What better way to beat the winters blues than to incorporate more green into my life? Nothing expreses more aliveness than the energy and vitality of a young sprout. And so the sprouting mission was born. It began with a desire for alfalfa sprouts, and like many gourmet grocery items, I was unable to find them fresh and organic up here. So why not grow them myself? Although, I could have bought a sprouting situation on Amazon or somewhere else on the web, I had a hard time justifying the $5 for a plastic cap that they inevitably would have sent in a too-big-a-box. One positive thing about living in the country, is that it forces you to be creative and crafty. So I made the lid myself. First I used cheesecloth secured by a rubber band over the top of a plain ol' Mason jar, but I quickly discovered that it took to long to drain the water. Also, I suspected that the cloth could be a breeding ground for mold. Although, many people have a succesful outcome with using a cheese cloth, I was inspired to find an easier, and what I believe, more sanitary method. On my second attempt, I used a Mason jar that I had in my pantry and traced the cap with a Sharpie onto a piece of scrap screen. I cut out the screen and pushed it into the lid. After sprouting my first round of seeds, I discovered that a wider mouthed jar would have been better, so I set off to the hardware store for more supplies. I am so grateful for my little town hardware shop. I have to come to appreciate a store that has all the tools I need to make things myself. The sweet man behind the counter hooked me up with some free screen, and I purchased a case of wide mouthed Mason jars. Now that I have a case, I am ready to fight the winter blues with an arsenal of sprouts. I do plan on returning to my little town shop with some freshly grown sprouts for my friend. Afterall... it makes me feel the better to do things for others, especially when they do kind gestures expecting nothing in return. Even if it was just a piece of screen, it is the little things that count you know. - First soak the seeds 6-12 hours in clean fresh water. I tend to place the seeds in their own jar and soak them in water just before I go to bed. In the morning while my morning coffee is brewing, I drain the soaking liquid and rinse the seeds a couple times. - Drain the soaking water well and then store the jar in a dark place. Be sure to rinse and drain the seeds twice a day (in my case, the first thing and the last thing I do each day) and store in darkness. Repeat this process for 3 days. - On the 4th day, place the sprouts in the sun to start the process of photosynthesis. Leave them in the sunshine all day or until they look ready. Once they are ready remove them from their sunny splendor and store the sprouts in the refrigerator. They will remain good for up to a week. 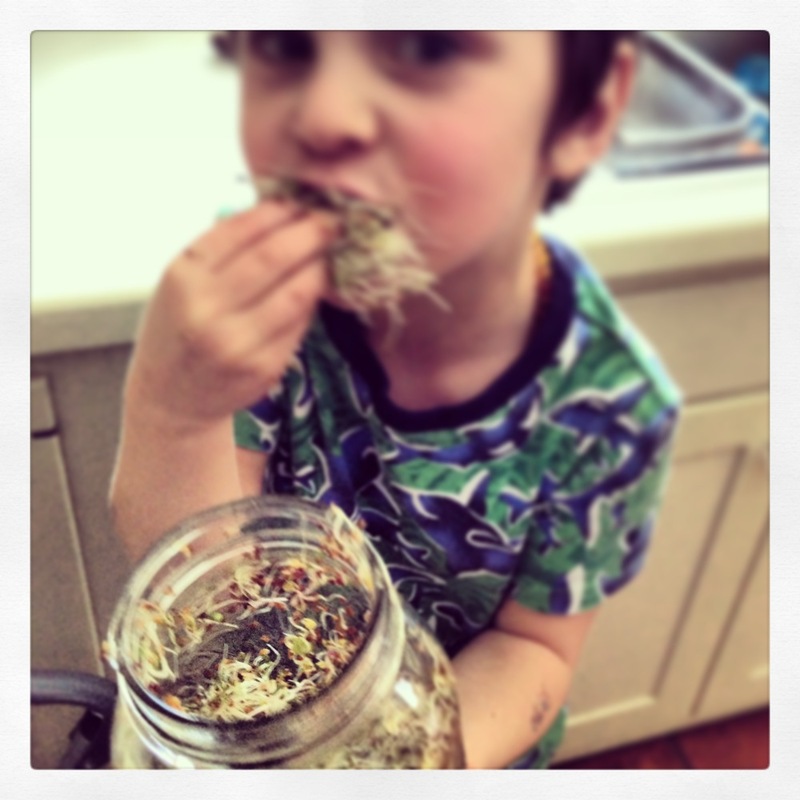 My eldest son, Timo, grew this jar of an alfalfa blend. Children tend to get excited to eat what they grow; however, I could not have anticipated my little man eating sprouts by the handful. I have been also juicing everything under the sun, especially greens. Here is some carrot apple juice. I have been taking good care of myself, and I feel a substantial difference. 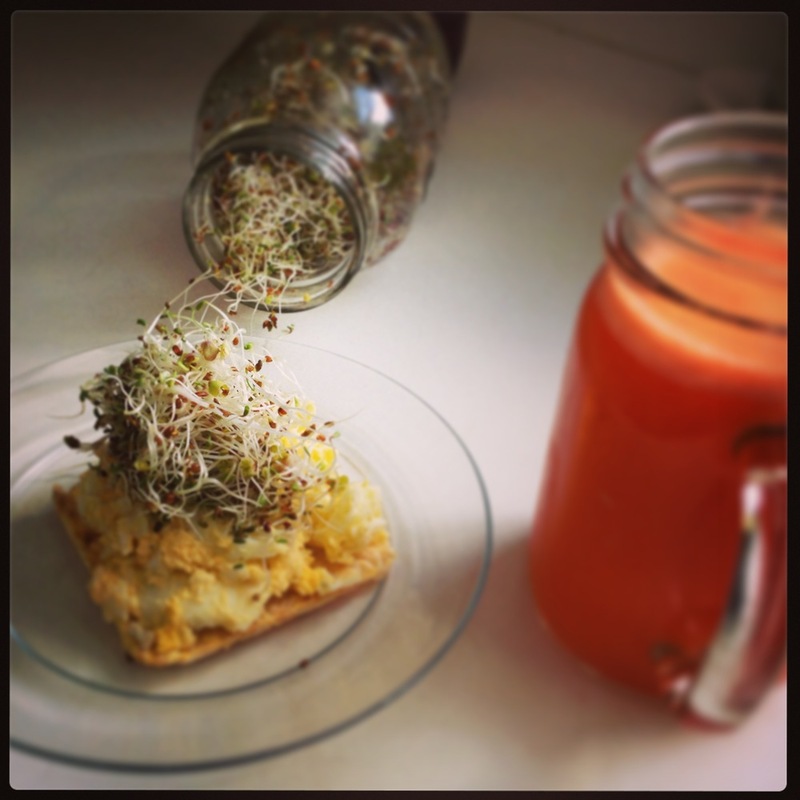 Sprouting is an amazing process. To think about how much energy can derive from such a small or grain. The energy force is so powerful that it made me think of Yoda and his explanation of the force. [Luke can't levitate his X-Wing out of the bog] Luke: I can't. It's too big.Yoda: Size matters not. Look at me. Judge me by my size, do you? Hmm?Hmm. And well you should not. For my ally is the Force, and a powerfulally it is. Life creates it, makes it grow. Its energy surrounds usand binds us. Luminous beings are we, not this crude matter. You mustfeel the Force around you; here, between you, me, the tree, the rock,everywhere, yes. Even between the land and the ship.